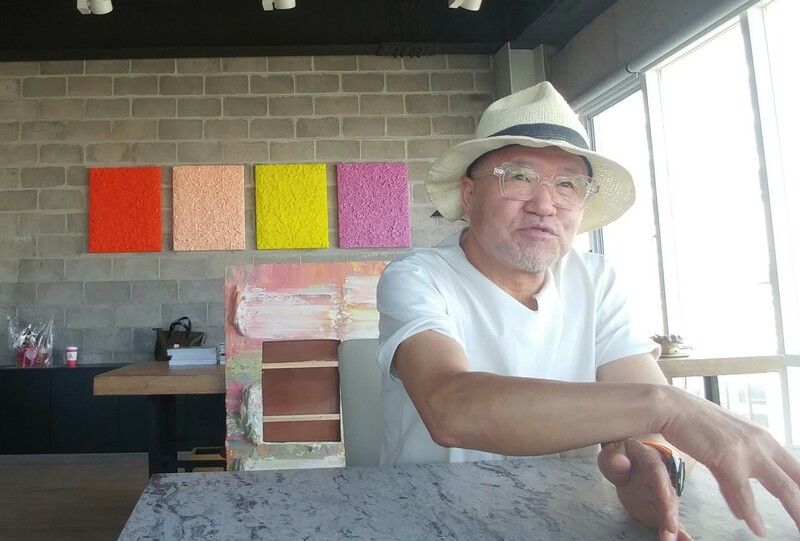 ‘World Top 100 Art Collector’ and owner of Arario Museum Kim Chang-il on what art is to himKim Chang-il (CI Kim) on his art, business, and galleries on Jeju. Kim Chang-il, or CI Kim if you want to use the name he signs his art work with, is a man of many talents. Starting out in his youth as an entrepreneur, he quickly built up his family's shop before expanding his entrepreneurial empire into movie theatres, department stores, restaurants, and, most importantly, art galleries. It is through his art galleries that he is perhaps most well known and he was recently named as one of the ‘World’s Top 100 Art Collectors’ by the influential art magazine Artnet. This carried extra significance because he was the only Korean collector to make the list. He currently runs galleries in Seoul, Shanghai, Cheonan, and Jeju where he shows off work from both famous and up and coming artists. The final talent of Kim Chang-il is that of an artist, and he now holds a private exhibition of his work every two years. 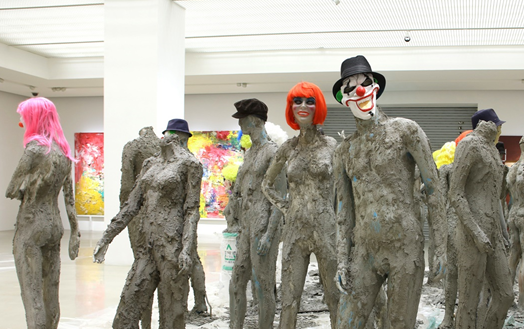 His current exhibition titled ‘(Non)-Nonda Nora’ ('Playing the fool') is being held at the Arario Gallery in Cheonan. This gallery sees Kim use construction materials as the materials for his artwork which includes large-scale pictures, art installations, sculptures, videos, and photos. 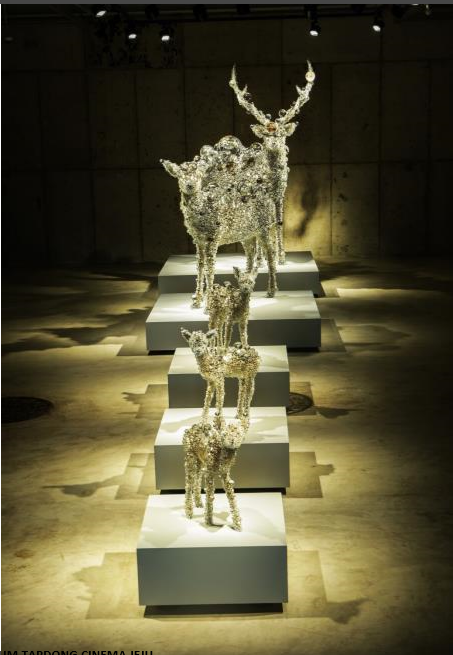 In this interview he spoke about his work, his most recent exhibition, as well as the galleries he opened on Jeju. 1. Why did you choose the the title ‘(Non) Nonda-Nola’ for your latest exhibition? The Chinese character '㯎', which means stupid, is not a familiar letter. This one letter has two Chinese characters 木, which means tree and 言, which means words. Which is more stupid: a tiger in a cave or a wild tiger? Is the tiger in the cave, who is provided with all its food, the stupid one? Or, is it the tiger roaming wild searching for prey that is stupid? Stupidity is a double-sided character. In fact, artistic languages and acts often seem stupid compared to natural beauty. In our society, we have a deep-rooted perception that art needs a license through learning. Art used to be considered the preserve of learning. If one didn’t graduate from art college, his/her artworks would be laughed at. In such an atmosphere, people looked at me, as someone who never went to art school, with jaundiced eyes. To me, what is more important is not whether I went to art school, but instead, whether I have the artistic DNA in me to allow me to express my potential artistic sentiment. Learning is not necessarily a bad thing and, of course, I do learn. However, learning is not restricted to the space of a university. I learned about what I want to do on the sites of my businesses. For example, designing the interior of bathrooms while I was running a restaurant was a valuable learning experience. I have met many artists who run galleries. I think about whose artworks will be displayed constantly. This all helps me learn as an artist. 3. I was told you used to be a loner in your childhood? I used to talk to trees a lot and everyone used to say that I might have an illness. I even went to the doctor. I was a complete social misfit and loner. However, while people said I might be ill, if I had listened to them, I might not be who I am today. That was my DNA. Talking to the trees is not about getting answers from the trees. Instead, I talked to the trees and imagined what a tree might say in reply. I had endless conversations in my imagination with trees, stones, and butterflies. I focused on asking questions and answering them myself. I really enjoyed it. In fact, I still have that habit and I have constant conversations with the artwork that I collect. This is a habit from my childhood. 4. You are an entrepreneur, artist, collector, and gallerist at the same time. However, people see the boundaries between those things. What do you think about your identity? The world has changed. A good artist not only learns from his/her profession but also other jobs in this era. For instance, those who make lamps can also be video artists. People can take things from their own fields and strengthen them to make a new type of art. Business and collection have a big interconnected relationship. I learned about materials from my business. The materials that are used in my current exhibition are based on materials that I learned about from my business experiences such as plywood, concrete, and cement. These materials became the materials for my artworks. It works both ways and if I didn’t know about art, there would be many problems in my business as well. By collecting and working on art, I can get a good eye for design and my artistic sense can influence even something as simple as a toilet interior in a restaurant. 5. What brings you to Jeju? 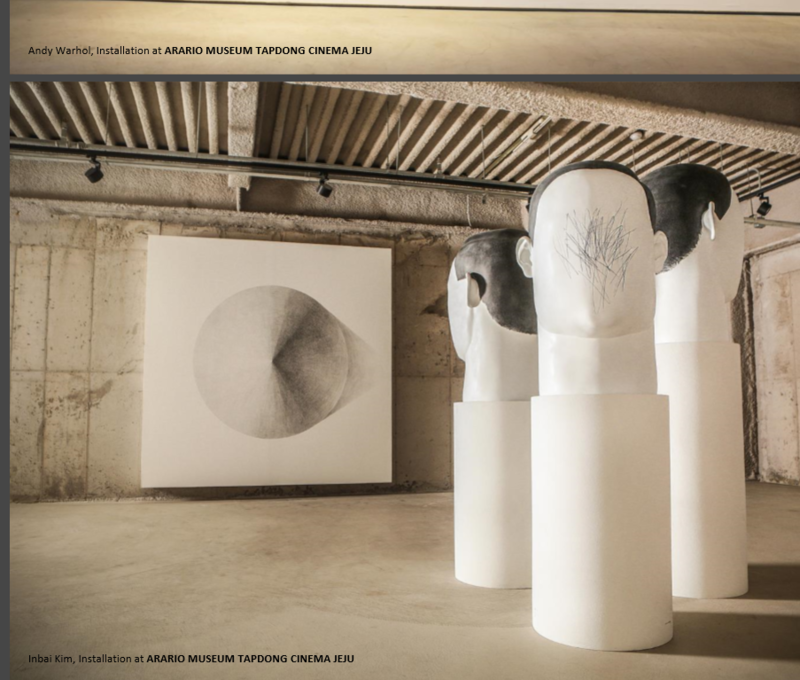 You made four Arario galleries in the Wondoshim (old town) area of Jeju city. I didn't try to find galleries in powerful and greedy cities. I considered two different options for the galleries that are currently in Jeju. It was between Tongyeong and Jeju but I decided against Tongyeong due to the reckless development that has taken place there. Of course, there is ongoing development in Jeju but there is still some purity left. Everyone opposed my idea of buying abandoned buildings in the Wondoshim to change into four galleries. Everyone was against the idea of building four galleries in Jeju at once. However, I made my decision based on what I thought Jeju will be like in 10 years or in 20 years. “Simple & soul” is the vital concept that I always keep in mind when doing my business or arts. "Soul" means feeling life. I felt that in Jeju. In particular, I like the wild flowers in Jeju. I felt a strong shudder from the primary color of yellow wild flowers. 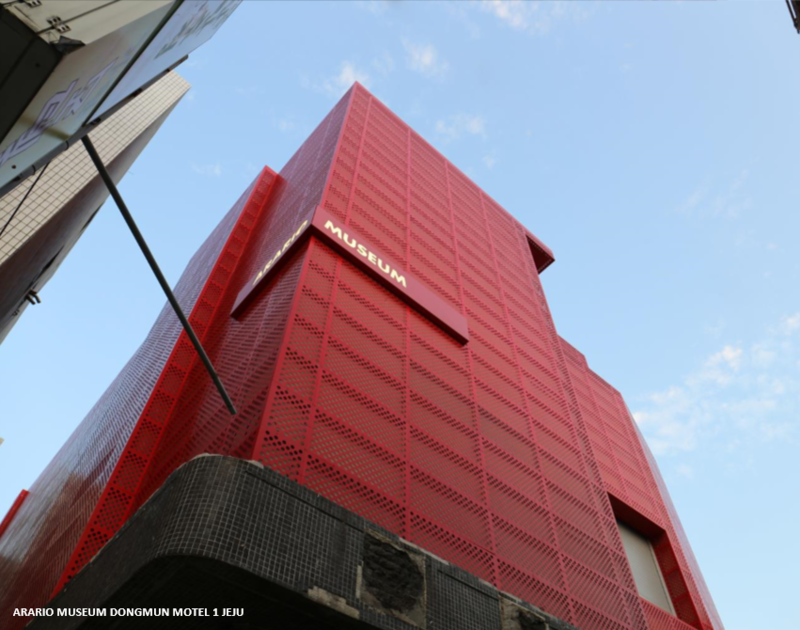 When I built the Jeju Arario Gallery, the reason I chose the color red for the building’s exterior is to communicate to other people the same strong feeling that I had from Jeju's wild flower. 6. How important is it to do things in your own way? Ironically, when I started things, all people said that this was crazy. But, in every decision and thought I make, I am the one who begins it and then completes it. What is more is that I enjoy the process. When I started in the theater business in Cheonan, even experts said that six screens was the maximum number that I could make. However, I pushed ahead for 14 screens because I could see what the area would be like in 10 years. Now, my theater takes the top place among private theaters. When running galleries, I work on planning and designing by myself and participate in the artwork display process. That was my dream and actually doing it is like my actualizing my imaginary play. When designing my Jeju projects, I entered abandoned buildings in the Wondoshim and tried to imagine how the ideas I had would look in the building. Entrepreneurs and experts said I am crazy. Now, four Arario galleries, a book cafe, a bakery, and Magpie Brewing Co. are in Tapdong and have brought a new feeling to the Wondoshim. 7. What do you think about the social responsibility of art? Do you feel any responsibility on Jeju in particular? What is art? Are only things that are visible art? Can't smellable things be arts? Can't tasteable things be arts? Even the smells of the space that I made matter to me. I want to share the whole result of my feeling and experience as well as my feelings, worries, and hopes. Sharing the feeling of the touch of art itself is the starting point of the social responsibility for artists. Politicians take responsibility by talking and persuading, professors do so by teaching, and I share the results which I have accumulated from my experience over many years. For me, building galleries and giving the feeling of touch to people who visit galleries is my social responsibility. My worries about Jeju will be in the same context. For example, I had thought about Dol Hareubang, the symbol of Jeju for 10 years. I didn't like how the Dol Hareubang shape seemed to be consumed and installed anywhere. One day, I looked differently at the shape of Dol Hareubang. I thought about how I can increase the value of Dol Hareubang with its figurative formation. I believed the Dol Hareubang can be contemporary art so I carved a Mason's name on it and displayed in the gallery. Until that happened, I was so confused. 8. Any business you start is successful. What is the secret of your success? The way that businesses that make profits and the cycle of arts is very different. It is very impressive how you harmonize those two abilities. There are many that suggest or are tempted to say that I have good business skills. Even if you run many businesses it is important to concentrate on them as when you gain one success, you can also lose one. If you are obsessed with money, when you have money, there will be nothing left. If it was for money, I couldn't do it. I make decisions based on the flow of history and the future. What do farmers want the most? It's productive land. When farmers sow and plant seeds, the only thing they think about is productive land which enables them to cultivate rich fruits. It is the same for me. It is like a rule. When the land in my mind is fertile, I can bear fruit from the good seeds in my brain. One way to keep the earth in my mind fertile is to gain energy from my regular life. A lot of people who want to be rich don't follow the principle well. If one cannot be fertile land by oneself, then he/she would be a hypocrite or swindler looking as if he/she is rich. 9. How do you look at Jeju’s nature from an artist’s perspective? Let's say there are roses and wild flowers. Nowadays, roses are cleaned to be sold in flower shops. Roses have their roots cut and their branches are wrapped in vinyl. Manmade beauty is like these roses. After a week, when a flower withers, it is difficult to deal with. On the other hand, after wildflowers wither, there is no despair or vanity because there is hope that it will bloom again someday. The beauty of nature is in this vitality. I feel small and miserable doing art in front of great nature. At the same time, I feel like I need to make people feel life and soul in artworks. It's a pity that people don't feel Jeju's nature and notice Jeju's gems. Why do people build so many things along the coast? I believe people have to refrain from covering the natural beauty of Jeju with too many artificial factors.